Then a few days in the Dolomites are suggested. Call it what you will: Sud Tyrol, Alto Adige (the high end of the Adige river), just plain Dolomites as we Americans best know it, a stay here presents an opportunity to experience some of the best scenery, and world class activities available in northern Italy. Dramatic landscape in the form of sheer rock is the foundation, so bring comfortable hiking shoes and leave your stilettos at home. Easily accessed from the Venice or Verona airport, a car is essential though mass transportation is available to help you explore the four Valleys and general area. 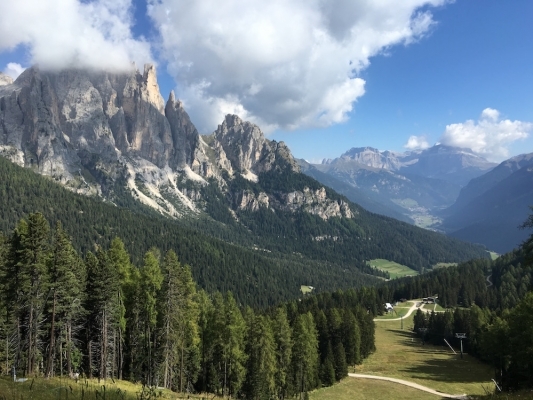 Val Badia, Cortina Valley, Val Di Fassa, and Val Gardena all share similar architecture, foods and the Ladin culture which feels more like Austria. German is spoken in addition to Ladin and of course Italian. To learn more about the Ladin culture, you can visit the Ladin museums dotted on your route starting with the well-designed modern museum in Pozzo di Fassa. Hikers rejoice. Easy access to high alpine trails above the tree line are a welcome assistance so you can witness the vastness of these peaks and terrain. For those who enjoy rock climbing, there is the Via Ferrara all ready for you. Trails, trails and trails. Miles to explore with abundant wildlife: marmot, deer and camoscio (also on the menu I am sorry to report). Local wines featuring indigenous grape varietals less known in the states are good and inexpensive: Lagrein (DOC Lagrein dell’Alto Adige) and Teroldego (DOC Teroldego Rotaliano). The entire area is clean and neat, even the firewood is perfectly stacked. The star of the area is the Sella group, a massif that you can ski, hike, bike, or drive around and admire nature at its finest. The area has a plethora of alpine style hotels for all price points. The child friendly nature of the area makes it a perfect family vacation spot. An added bonus, fresh delicious apple strudel is never far away. We suggest you combine a visit here with one or two of the northern lakes, Lake Garda or Lake Como, and then to Verona or if you must Venice, spending a few days in each. Why not stay away from the crowds on your next trip to Italy, and plan to enjoy this chaos free region?